A favourite restaurant of locals and visitors, right by the sea at Aghia Paraskevi in Monolithos. Full fresh fish perfectly grilled and delicious appetizers, as well as savory meat dishes, such as stuffed hamburger. Located on the sandy coast. The interior cobbled space offers cooler temperature, for those who prefer it. 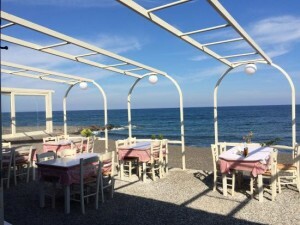 Favorite dishes: shrimps risotto, Fried Eggplant, Fried Zucchini, tzatziki, Santorinian salad, fried cod.